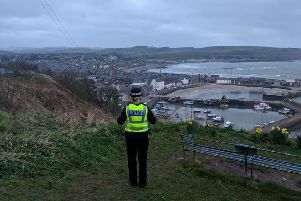 Officers in Stonehaven are appealing for witnesses regarding the manner in which a white Citroen van was driven on the A90 on Monday afternoon (May 30). The incident occurred between 4.20pm and 5pm on the southbound carriageway between Aberdeen and Laurencekirk, and involved a white Citreon van, which may have collided with other vehicles. It is believed that the van collided with a blue vehicle near Muchalls. The driver of this blue vehicle is urged to come forward with information that may assist officers with their enquiries. Anyone with information is asked to contact Police Scotland on 101 or Crimestoppers on 0800 555 111 if they wish to remain anonymous. A 37 year-old man has been charged in connection with road traffic offences and enquiries are ongoing into the incident.